Parisa Samadi was born in Kermanshah, in the western part of Iran. 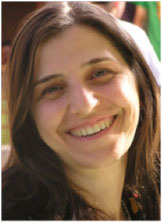 Her interest in languages started from her early exposure to the two natives languages of the area, Farsi and Kurdish. After high School, she moved to Mashad, in the eastern part of the country, and earned her science degree in Laboratory Sciences from Mashad University. She came in contact with a few native languages of that region, too. Later, she moved to Tehran and earned her BA degree in the French language. She translated a few books and many articles/short stories in various publications. She began learning English after immigrating to the United States and earned Associate Degrees in English, Liberal Arts, and Communication and Literature from American River College. She is currently a student at Sacramento State University and she will earn a BA degree in English next semester. She plans on continuing translation and writing poetry. She has recently completed a translation of the collected works of Ziaeddin Torabi. Her goal is to become an ESL teacher.